Later in 1998 the Dollar Coin Design Advisory Committee (DCDAC) was convened in <?xml:namespace prefix = st1 ns = "urn:schemas-microsoft-com:office:smarttags" />Philadelphia with the purpose of deciding what woman to portray on a new US "Golden" $1 circulating coin. Committee members included Mint Director Philip Diehl and Delaware Congressman Michael Castle. A Bessie Coleman concept was designed and presented to the committee in person by Daniel Carr. During the DCDAC deliberations, the Bessie Coleman proposal was in second place behind Sacagawea as the committee's choice. A photograph of the Bessie Coleman design was taken by an Associated Press (AP) photographer, and that picture was distributed to newspapers across the country. Many newspapers that ran stories about the DCDAC meeting also printed that photograph as the only visual record of the meeting. 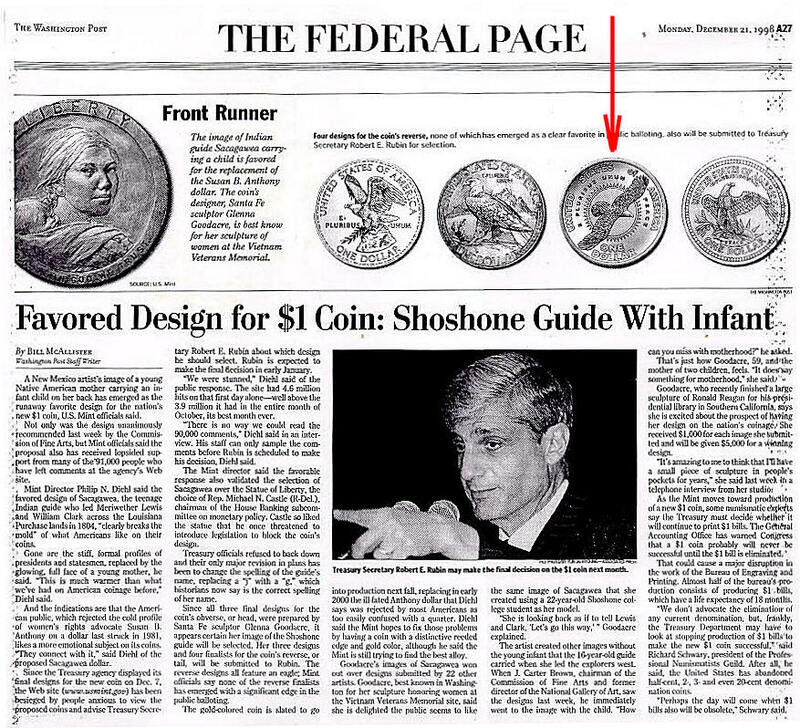 In early 1999, the US Mint held a limited invitational design competition for the new Sacagawea "Golden" dollar coin. Although not initially invited, a concept designed by Daniel Carr was one of only two designs accepted from outside artists in the competition. The Eagle side of Daniel Carr's Sacagawea concept was one of seven US Mint finalists in the competition for the “tails” side of the actual Sacagawea dollar coin (see below). This design had evolved from his original Apollo Astronaut reverse concept. Later in 1999, Daniel Carr was invited by the US Mint, along with 15 other Artists and 10 Mint staff, to submit designs for all five of the 2001 state quarters. Carr's designs were eventually chosen and used for the actual New York and Rhode Island state quarters. The US Mint paid an honorarium to Mr. Carr for the two designs. Private pattern of a design under consideration by the US Mint and Congress.